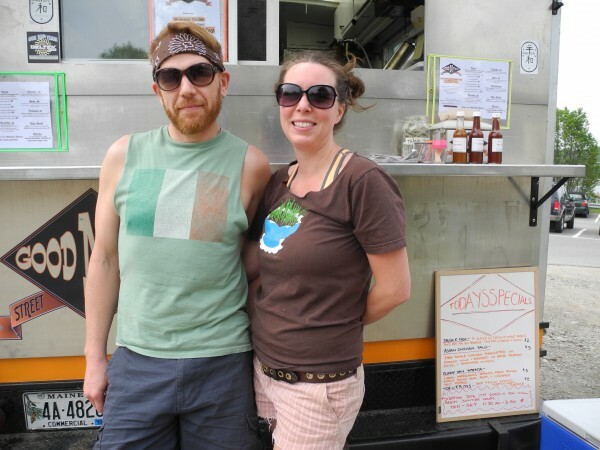 Seth Whited and Sarah Waldron serve lunch offerings including tacos, gyros and tofu frites from their Good 'n' You street food truck. BELFAST, Maine — Two winters ago, Seth Whited and Sarah Waldron, both of Belfast, were lying on a beach in Jamaica trying to figure out how to change their lives for the better. The answer the couple hit upon involved tacos, much to the joy of locals and others who have sampled their wares from Good ’n’ You food truck, parked at 39 Main St. since last summer. In addition to their abilities to make homemade corn tortillas and pile them with local meats, cabbage, pickled radishes and other tasty toppings, the couple knew that Belfast’s lunchtime offerings had room for a newcomer. “I felt like there are not a lot of fast options for food in Belfast that are wholesome and local,” Waldron said. So they called a guy about a food truck that had been home to the defunct Jamaican Grill in Belfast and was available for sale. They also developed their vision: They would serve street food from all over the world in addition to authentic Mexican tacos, a sharp difference from the Tex-Mex cuisine typical in Maine. They also wanted to mix up the menu. Recent specials have included spicy peanut chicken taco; tostada with creamy asparagus, egg and feta; sweet and spicy sausage taco and crispy tofu frites with locally made Heiwa tofu. The regular menu also includes burritos, falafels, gyros and special choices for kids. And prices are reasonable. Tacos run $2 to $3 apiece, and burritos are $8. All the lunchtime items are made in the silver truck, where on hot summer days, temperatures have reached 120 degrees. They divide the labor — Whited works the grill and Waldron mans the window and dresses the food. Waldron and Whited have worked in the food industry for more than 20 years combined, and still work at Three Tides bar and restaurant in Belfast. What allows them to get along, even on hot, busy days, is a belief in what they’re doing. In the height of the summer season, all their produce comes from local farms. The fish, beef, and chicken are always local, too. The only imported item is masa flour from Mexico that they get shipped to Maine in 50-pound boxes. Business proved good enough last summer to set up shop again this year, they said. “All winter long, people had been asking us about it,” Whited said. So far, this season has been busier than last year, and there are some days when they sell out of everything. They’re open 11:30 a.m.-3 p.m. Monday-Saturday. In July, they’ll be doing something new: serving grilled pizzas on Friday nights. Last summer, the truck stayed open until October, and if the weather cooperates, they hope to keep on slinging tacos until November this year. That sounds good to fans such as David Martinez of Belfast, who has become a repeat customer this summer. He was eating the last bites of a couple of tacos last week. “It’s good,” he said of the street food. For information, find them on Facebook at facebook.com/GoodNYouStreetFood.